Seen from the consciousness-aspect, then a human being seems to be akin to the wholeness, to be transcendent in relation to these lawfulnesses (also the quantum laws). The wholeness is one and the same as reality. So, in my view consciousness, wholeness and reality is one and the same. Please give this a moment of reflection. Awareness seems to be a quality of the now, and therefore a quality of life itself: nature. Many ancient Indian scripts say that the Universe is in meditation, or rather: the Universe is one great meditation! When you are in the Now life, nature and universe expands. Awareness seems to have the qualities of openness and spaciousness. Unawareness closes these qualities. We can all experience this quite easily. Take a walk in the forest. Unawareness, or distractedness, cause that we don´t see the nature we are walking in. Awareness causes that we see it much more clearly. And by practicing meditation (awareness in now), you begin to connect with this open dimension of your being. In fact, it introduces you to the unlimited spaciousness that Buddhists call Sûnyatâ (see my book Sûnyatâ Sutras). This spaciousness is also the source of love. Spaciousness is simply love. The openness and the spaciousness come from your heart, not you head. It is not neither mental nor material. In other words: Matter (hereunder the body) and mind (hereunder thoughts, the unconscious, the psyche, subject, the content of consciousness) – are something else than consciousness itself. In Western philosophy they have only contemplated the content of consciousness, and not the form (though Kant was very close to it with his concept of The Transcendental Apperception, the unity where the self and the world come together). They haven´t looked into the consciousness itself, as you do in meditation, but only followed its direction towards an object; what you call the intentionality of consciousness. In fact, they claim that consciousness always must have intentionality. But this is only what I refer to as the mind. Intentionality is the power of the mind to be about, to represent, or to stand for, things, properties and states of affairs. Meditation stops the intentionality, and directs the mind into its source, namely consciousness itself, which is one and the same as reality and wholeness. You could also say that meditation changes the consciousness from being one-directional to being bidirectional. Bidirectional consciousness means that the consciousness both is directed towards its form and its content. It is being open to the form of consciousness, aware of both magnetic poles in the field of subject-object experience. I have also called this the wholeness of the observer and the observed. In his book Bevidsthedens Flydende Lys [The Flowing Light of Consciousness, 2008] the Danish philosopher and spiritual teacher Jes Bertelsen says, then you actually can make a fascinating comparison between Kant and the Tibetan Dzogchen master Longchenpa, because where Kant´s philosophy stops with the transcendental apperception, Longchenpa´s philosophy begins. Where Kant´s philosophy goes in the direction of the content of consciousness, and describes the categories of experience, Longchenpa´s philosophy goes in the direction of the form of consciousness, and describes the categories of enlightenment. 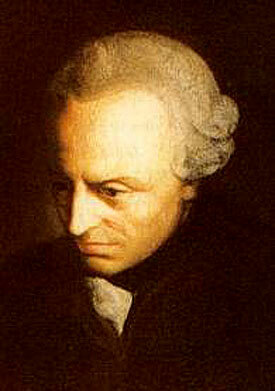 Kant doesn´t mention the enlightened state. Longchenpa doesn´t mention the content of consciousness. Tibetan Buddhism in fact has a name for Kant´s transcendental apperception; it is called Rigpa, the knowing of the original wakefulness that is personal experience. So Kant and Longchenpa have the same starting point: the transcendental apperception, but go in two different directions. Together they could form the complete philosophy of the bidirectional consciousness: a mandala of the cosmos. The little module was beyond the moon. That was a part of space that no one had ever before visited. Yet the scientists in Houston knew exactly how much energy to eject from those jets, when turned in just what direction, to bring the module down from outer space to within a mile of a battleship waiting for it in Pacific Ocean. Kant´s reply to the question was that the laws of space are known to the mind because they are of the mind. They are of a knowledge that is within us from birth. A knowledge a priori, which is only brought to recollection by apparently external circumstance. During the following flight, when Armstrong´s booted foot came down to leave its imprint on the surface of the moon, no one knew how deeply it might sink into lunar dust. That was to be knowledge a posteriori, knowledge from experience, knowledge after the event. But how to bring the module down, and how to get it up there, had been known from the beginning. Moreover, those later spacecraft that are now cruising far beyond the moon, in what is known as outer space! It is known exactly how to maneuver them, to bring messages back, to turn them around, even to correct their faults. In other words, it then occurred to me that outer space is within inasmuch as the laws of space are within us; outer and inner space are the same. [Here Campbell is wrong, since Jung´s archetypes are a psychological reduction of reality. The Buddha realms and Plato´s universal ideas are ontological realms, not psychological realms. Campbell is therefore himself in danger of ending in psychological reductionism. I will return to this]. [I have termed these tracks, trails and footprints as “The dreaming tracks and songlines in the artwork of Man and the Universe,” or as “the universal images in time.” They correspond to progressive karma. I have, with inspiration from Karen Blixen, termed the Original as “The Ancient”]. The unity of the self and the world, the place where the outer and the inner worlds meet, is the transcendental apperception, or Rigpa: the wholeness of the observer and the observed. 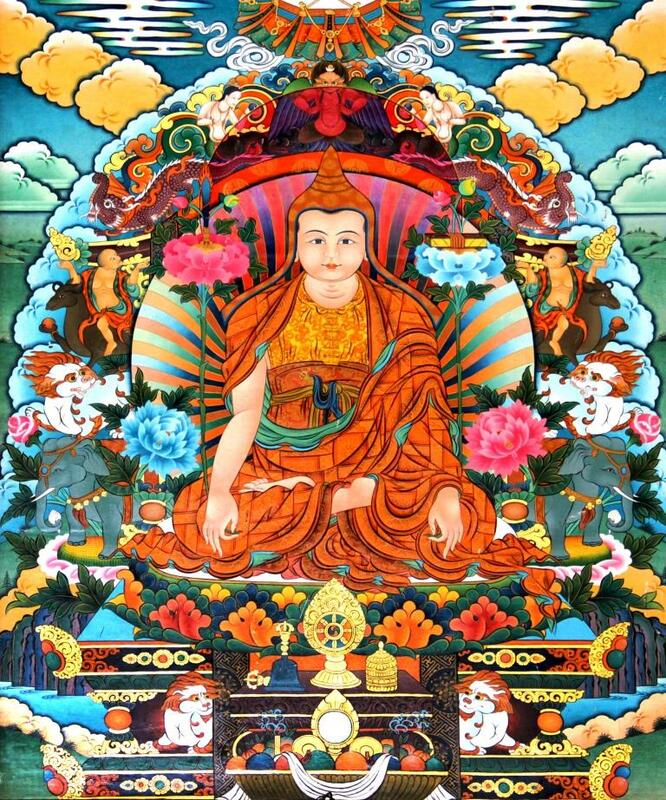 Now, if we should follow Longchenpa from the transcendental apperception, it would be in the opposite direction, in towards the Original, the categories of the unmanifested, the form of consciousness, or the enlightened mind. In the following I will follow Jes Bertelsen´s account of this. Trektjö moves from the concrete formations of phenomena, thoughts and experiences, emotions and senses into the Original, into the source from which all concrete formations of phenomena, thoughts and experiences, feelings and senses come: the creative formless openness of the consciousness, the apperception's basic space. Tögal relates to the appearances because Tögal is to see the apperception's spontaneous self-radiation without that the apperception forgets itself. Another Dzogchen master, Tulku Urgyen, said: The Tögal visions are rig dang, the self-radiation of Rigpa. However, Tulku Urgyen continued, if there is no actual recognition of Rigpa, the visions are lung dang, manifestations of the karmic wind, pure dual fixation. The message in Tögal is that consciousness can rest in recognition of its innermost essence. Tögal only works when the consciousness is in the Rigpa state. The visions are only Tögal visions when they are apperceptive: while the visions are happening, the observing consciousness rests in nondual apperception. Tögal is to see with Rigpa, with apperception, to see with the nondual self-conscious consciousness beyond language. Where Trektjö is the movement from the dual mind to the nondual wakefulness, Tögal is insight in the creation of the world. Tögal is an insight into how the world, language and mind every moment are spontaneously created by the enlightened unity-consciousness. This process usually takes place automatical or hidden. Our dual mind does not perceive that the mind itself and the world-image are recreated and thus maintained every moment – seen from the perspective of the totally liberated unity-consciousness. You can´t see this until you have discovered and stabilized the Rigpa-consciousness - claims Dzogchen. Every single moment's restoration of self-image and world-image can only be seen from the apperception's consciousness-dimension, the nondual wakefulness. 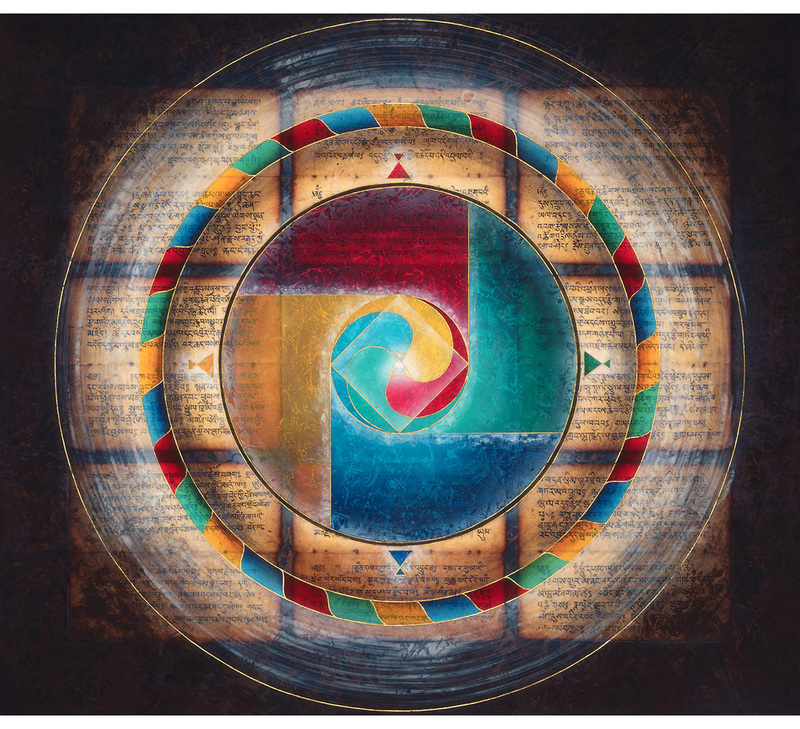 The Tögal visions begin by themselves when Rigpa is stabilized; that is: when the consciousness rests without effort and thought, wide awake in the unity of apperception. It seems to be a common experience that when consciousness, without a single distraction, rests in the recognition of the innermost consciousness somewhere between 5 and 10 minutes, then the apperception will begin to perceive the flowing light. Most often the unfolding process begins with spots or particles of light in the dimension of apperception. After the end of the state, when the dual mind and language want to describe these apperceptive light particles, the mind will locate them: in the heart, in the center line, in the pineal gland, in the focus point of consciousness, in the infinite blue sky. However, these Tögal points of light are embraced by the apperception. They are in the Rigpa dimension, and they are permeated by Rigpa. They are therefore only dual or analogue localizable. Our ordinary dual mind would - in connection with the registration, or just the description, of such a light particle - be tempted to explain, for example, a focus point of attention, a center of a symbolic circle, an energy whirl, a mandala or a cosmic point; that is: a point in a wholeness that gives access to the information of that wholeness. Or the mind would locate the event to a practice point, a point of Rigpa, a point of origination, or perhaps to the unity point of the apperception. If the nondual consciousness-continuum does not distract from these flashes of light and bright particles, they will develop by themselves. First, they form strings or chains or pearls of light points. Longchenpa calls them Vajra chains (rdo rje lu gu rgyad). The dual mind´s association series may be: association chains - thought chains - molecular chains - DNA strings - superstrings - the center line with its chakra spots - light beams - sun beams. When the light points subsequently have been localized in the heart, in the center line or in the infinity of the consciousness, these chains of light will afterwards naturally be located in the center line or in the outer blue infinity. "As crystal-light collected inside, stay in Dharmakaya, the basic space of origin." The essential is the constant, relaxed stay in un-distracted Rigpa-continuity. Distraction - language, comments, associations, experience-production, loss of apperceptive wakefulness into dual consciousness - transforms the situation qualitatively from nondual consciousness to the common dual mind, now filled with so-called spiritual experiences with their blend of imagination, healing, inspiration and what in today's language is called self-assertion: nutrition and air to the ego. Here, the situation turns around and goes towards Kant, Campbell, and religious interpretations. There is nothing wrong in this, except that you lose the direction towards enlightenment. The danger is spiritual crises and misinterpretations, or blends of personal, collective and universal images. The latter is what happens, for example, in a psychedelic trip. I have described this in my booklet The Psychedelic Experience versus The Mystical Experience. This has especially to do with the reduction (mix) of ontological realms (universal and collective images) to psychological realms (personal images). We saw that Campbell, due to his inspiration from Jung, tended towards this. Campbell´s theory is exceedingly conservative and founded on a deep nostalgia: for him, the cure for modern problems is found by returning to earlier notions of spirituality and moral virtue. In promoting a “living mythology,” Campbell harkens back to a lost “golden age” from which we have fallen, but to which we can return with effort and guidance of a “sage.” It is a reductionism, a psychologism. And herewith there is the danger of ending in idealism, and the same psychologizing, emotionalizing and therapeutizing ideology of our society, which New Age and Self-help stand for. As I showed above, I supply this with my own metaphysical double-aspect theory, and with this a philosophical principle, namely to examine, whether the karmic talk and experiences of the “experts” and their clients remove their energy-investments in the actual reality. If focus is displaced backwards, then the collective time has taken over and spiritual seen there therefore happens an escape. Such an escape is seen both in Freud, Jung, Rank, Grof, Janov, Campbell, rebirthing, regression. None of these people and theories can therefore be said to work spiritual. And if they use the karma idea in that way, it is no longer a spiritual help, it is a collective displacement of the focus backwards in time and therewith out of reality and into the unreality of the collective time. But what if we continue along Longchenpa´s path? In the foregoing we have described (with Jes Bertelsen as a guide) the development of the Tögal visions from one point to a chain or line of points. The next step is the spread of colours, as light, which breaks in a crystal, forming rainbow lights. Afterwards, when the dual mind takes over with language and division, this state is usually located in the heart, in the eyes or in the infinity of space. This spread of colour-shades expands to a general bright transparent quality of the apperception's space-like widen dimension as such. When this last step has been reached, the spontaneous self-radiance of Rigpa unfolds in the Tögal visions: the enlightened apperceptive direct perception of Man, the world, the cosmos, as flowing unlimited light, transparency and rainbow light, permeated by the cohesion of compassion and love. Krishnamurti´s Notebook -free download (Krishnamurti had daily experiences of the flowing light, which he called different names such as: presence, benediction, immensity, sacredness, or simply The Other or The Otherness. In his Notebook he, in an exceptional poetic way, described these experiences blended with descriptions of nature). Metaphysics. Ontology; Part 1: The Problem of Mind, from my online book Philosophical Counseling withTolkien (here I describe my concept of the metaphysical double-aspect theory). Atheist Fundamentalism (my notion of the double-aspect theory is described in the last part). The Psychedelic Experience versus The Mystical Experience. Star Wars (here I explain my own space mythology seen in relation to Campbell´s monomyth and the Star Wars space mythology). The Hero´s Journey (Campbell´s monomyth). The Philosophy of Karen Blixen (her concept of the Ancient corresponds more or less to the Buddhist concept of the Original – and she seemed to radiate a very high degree of spiritual insight).